When this pretty package arrived one morning, I knew I was in for a treat. 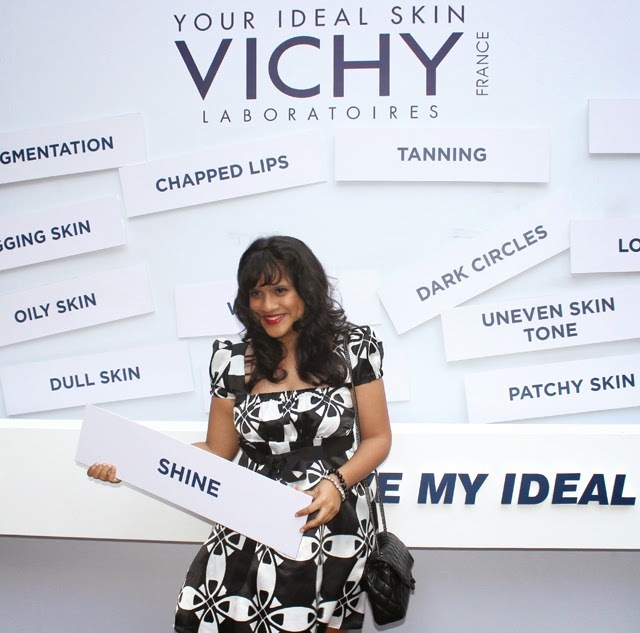 So off I went to spend a sunny afternoon with the fantastic team at Vichy and India's top cosmetic dermatologist. With reasonably fine skin all through my youth, I thought I had managed to duck the dreaded teenage acne. However, the winning combination of oily and sensitive skin; ensured that, before I was even across the finish line it caught up with me which has, since then, taken immense care and nutrition to rectify. That's one of the major reasons why Vichy is special to me. Their unique dermocosmetic brand of products is made especially for sensitive skin and has a number of ranges which are suited for just about any skin issue from acne to hydration to youth enhancing. 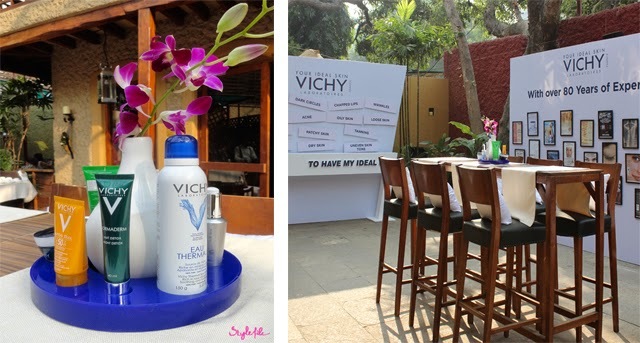 Being the first of its kind event hosted by Vichy for handful of journalists and beauty bloggers, we were introduced to the origins of the brand, its arrival in 2002 in India and how the world renowned thermal spa water came about. 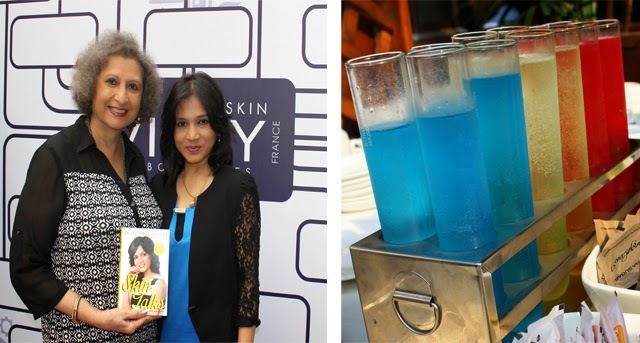 Jaishree Sharad, dermatologist to the stars, gave us insight into the way your skin functions, the best ways to nourish it and also launched her book 'Skin Talks'. After all the skin-tastic knowledge, a thoughtfully conceived skin bar checked your skin types and hydration while prescribing the best Vichy range for you. 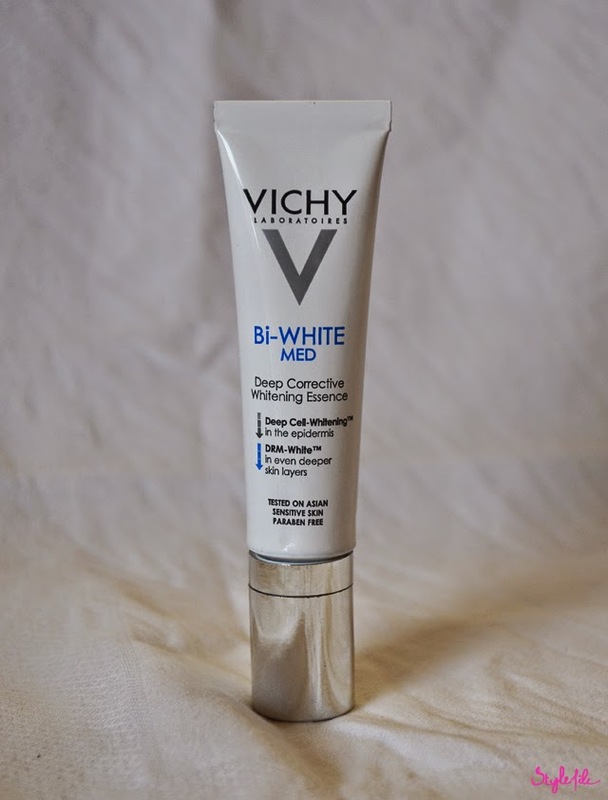 After playing around with their wide range of products, I've found that the Bi-White range to be my ideal fit correct any pigmentation issues post outbursts. To clear any misconceptions, the Bi-White range is created to brighten your skin tone and bring back its original tone when faced with discoloration. 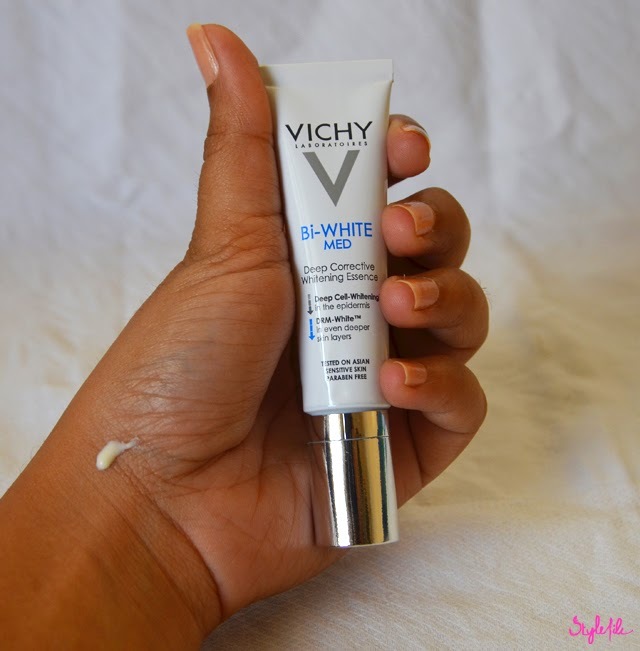 I've been trying out the Bi-White Med Deep Corrective Whitening Essence and here's my take on it. The tube packaging with a nozzle is not only portable but hygienic to use. The fragrance of the essence is citrus-like and refreshing. Although I've been using it for just a couple of weeks as a spot treatment on affected areas, I've seen a noticeable lightness in the areas of application while a month or so of its usage will truly tell of its efficacy. 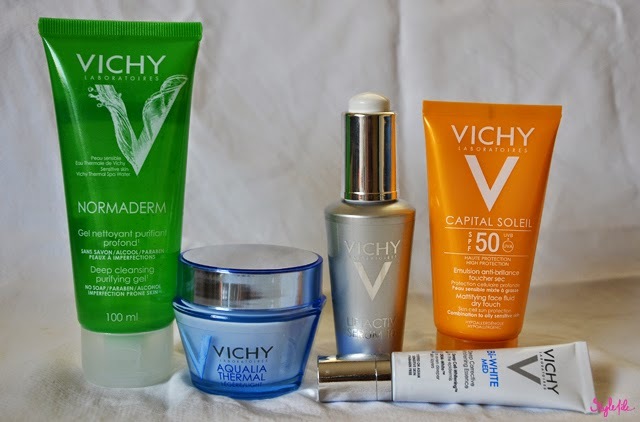 It is such a pleasure o finally meet Vichy, a brand that actually addresses the problems for different skin types and combinations like oily and sensitive skin and I cannot wait to dig in to them all! This is the most wonderful time of the year for good reason, dolls. Merriment is in the air, parties are in abundance and so are the sweets - No wonder its my favorite season! As soon as December rolls in, I add in my Christmas carols to regular listening, keep thinking about delectable Christmas sweets in an indefinite loop and I double up on sparkle, even on my nails. Today, I'm talking about bringing in the holiday cheer and how to have yourself a merry little Christmas. First things first, the decor. 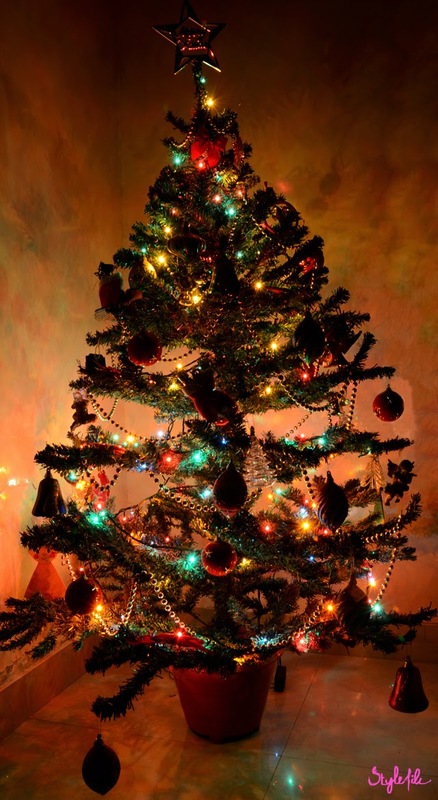 The most obvious place to start with would be with a Christmas tree, decked in lights for a festive touch. For a work station, you could even try a tinier tree with baubles like tinsel and ornaments. And while we're on festivities at the workplace, make sure you whip up a quickie game of Secret Santa if you aren't playing yet. Not only are stars a treasured Christmas symbol from the time a glowing star led the way to the manger but they add such a lovely touch to any surrounding when lit up outdoors in the nights. While the holiday has commercialized so much over the years, the real sanctity of it lies in a crib. As a child, I've spent an ample number of holidays crafting shrubbery and polishing statues for crib competitions. A reenactment of the nativity scene, even the simplest of cribs has story behind it. 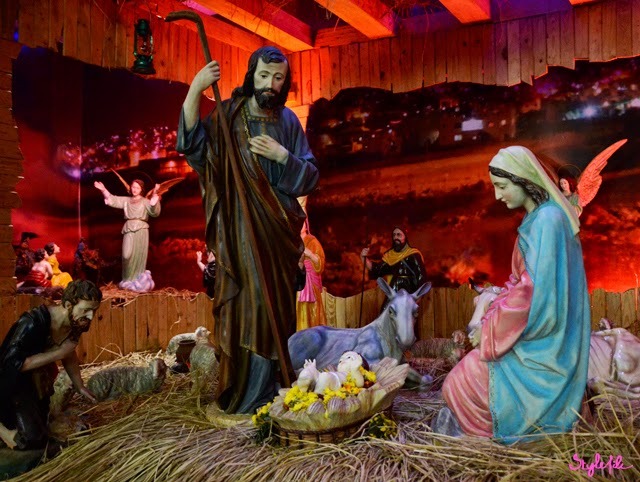 Most churches in Mumbai have beautiful cribs that painstakingly created so this time around, take a moment out to visit them. I've always had a love-hate relationship with the weather and currently, I've fallen hook, line and sinker for it. The nip in the air has got me bringing out my scarves, boots and blazers, as if it's snowing outside! Nevertheless, I love snuggling up in cozy socks and painting my nails *deep shades, sparkly ones & golds please! * and this is just the weather to do it. With the temperature finally hitting appropriate degrees, cute headgear, berets and beanies are at the top of my list. And of course, the highlight of the festive season, and my life; is good food. 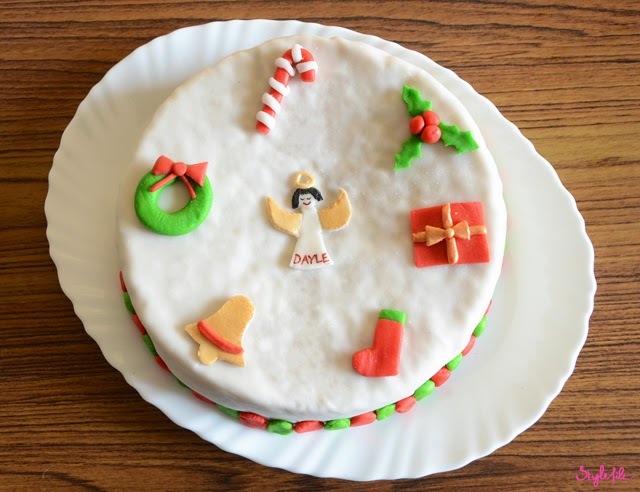 Thanks to my mum's line of work, I've got Instagram-worthy delectables 365 days of the year so Christmas being the special time of the year that it is, only fresh traditional Christmas cake will do - fragrant and moist with spices, liqueur and fruit. Share it at a sit down with the family and save a slice for breakfast! 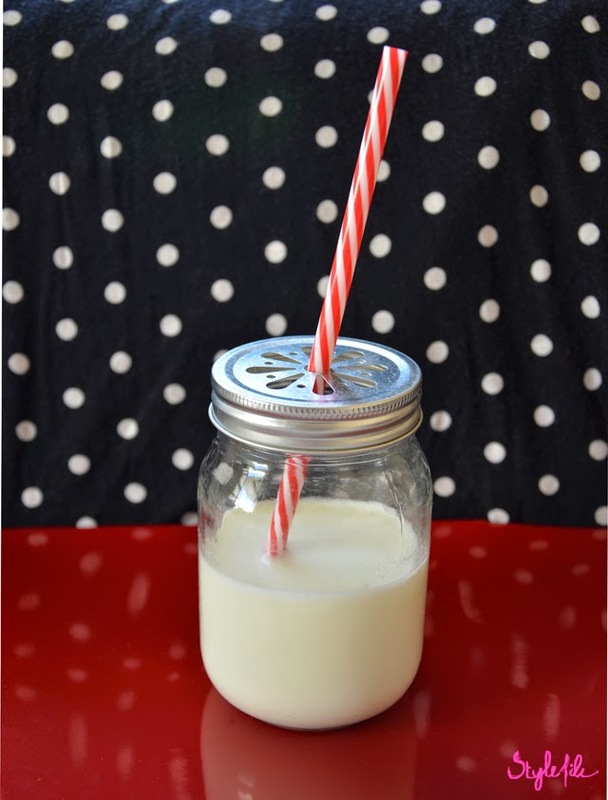 While hot chocolate is a go-to during the winters, I've know I've got to amp up my game in the festive season and that is what Eggnog is for! Best enjoyed creamy, warm and sweet; this guy will give those lattes a run for their money. 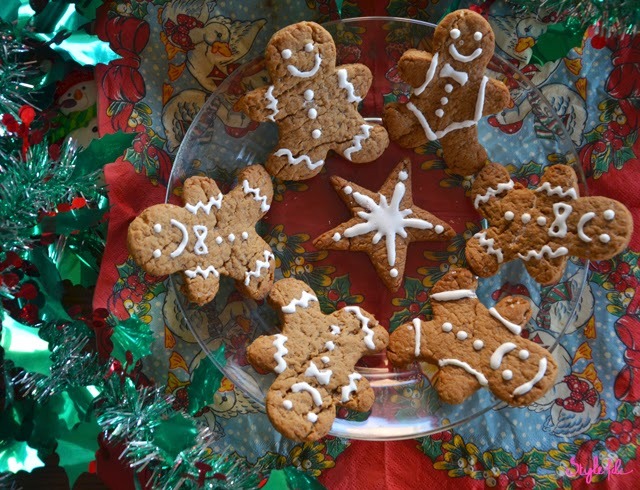 Another holiday favorite, is the timeless Gingerbread man. Not only are they spiced enough give you a warm, fuzzy feeling inside; they are freaking adorable and a hamper of them make for a nifty gifting option. I hope you've enjoyed the peek into how I bring on festivities and I'd love to hear how you bring in the cheer. 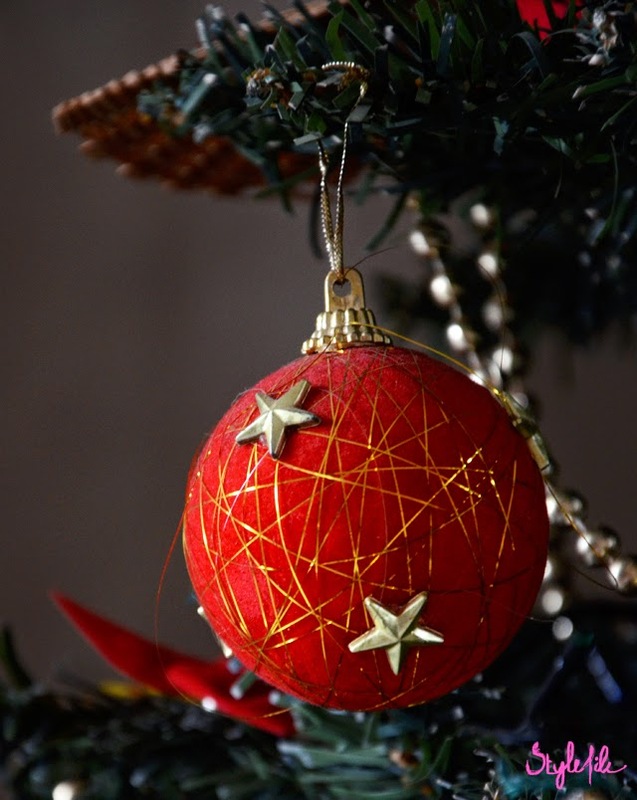 'Tis definitely the season to be jolly with festivities in the blogosphere galore! And one of those very delightful celebrations was the Aanam's wonderful blog, What When Wear turning 3 with Shazés very first event! 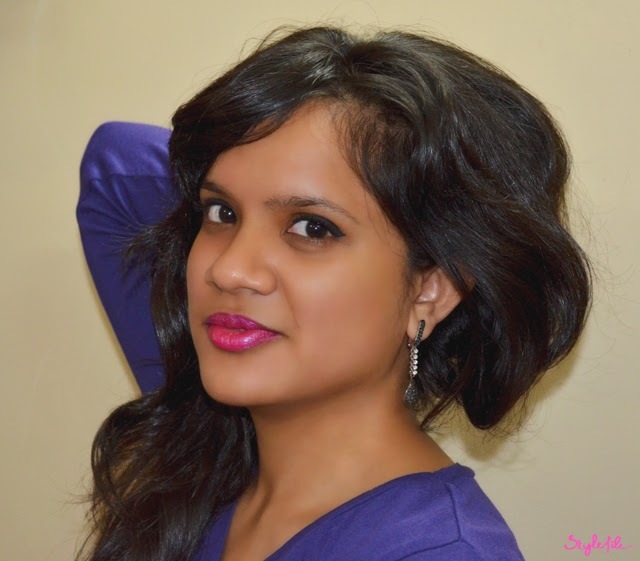 Shaze, a face in the home decor world, recently launched a brand new range of jewellery. 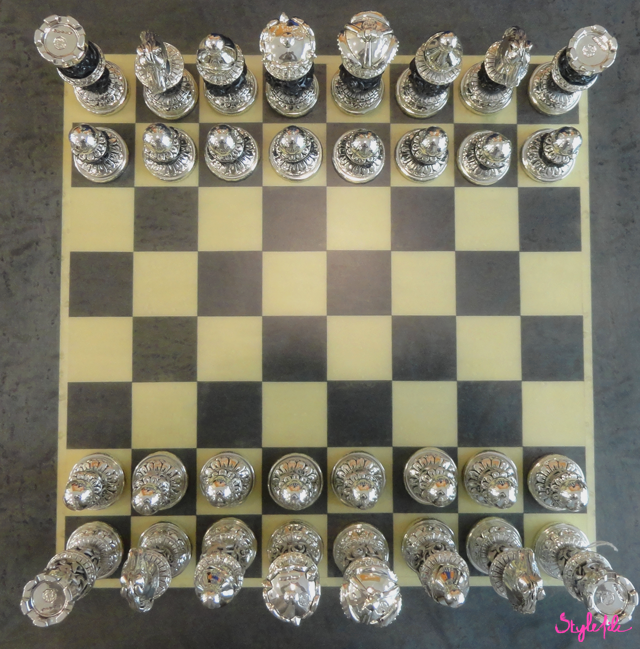 The very concept that Shazé is based on; is actually the wonderful aspect that sets it apart. We love to doll up for a birthday lunch or a round of cocktails but beyond that, our regular dressing tends to be rather hum-drum. With their spiffy new campaign, UnOccasion; Shazé wants to change that. The weekend started with a plesant preview of the various collections of Shazé ornaments and accessories while sipping a refreshing iced tea. Their range of decor can add the living in any living room with cutlery, home accessories and even pieces especially for your the tiny tot. They've created jewellery in a variety of patterns and finishes which is designed in Italy, so if you're a minimalist girl like me, you're in luck! And for the statement lover too they've got a number of pieces galore! 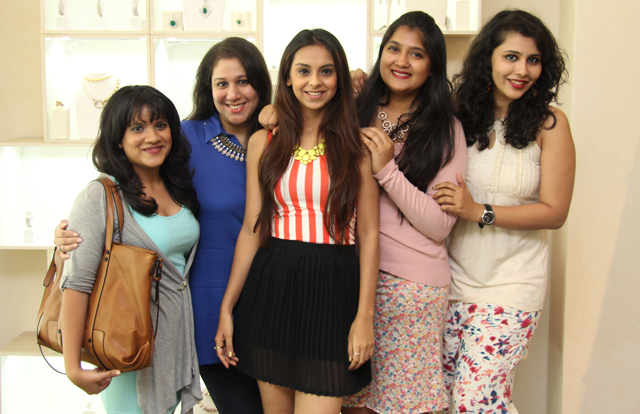 Beyond just eyeing the pretty pieces, we had a tonne of fun styling a look with them as well. Helping each other getting their style quotient straight, preening for the cameras and a tête-à-tête on everything under the sun were just some of the things under the itinerary. 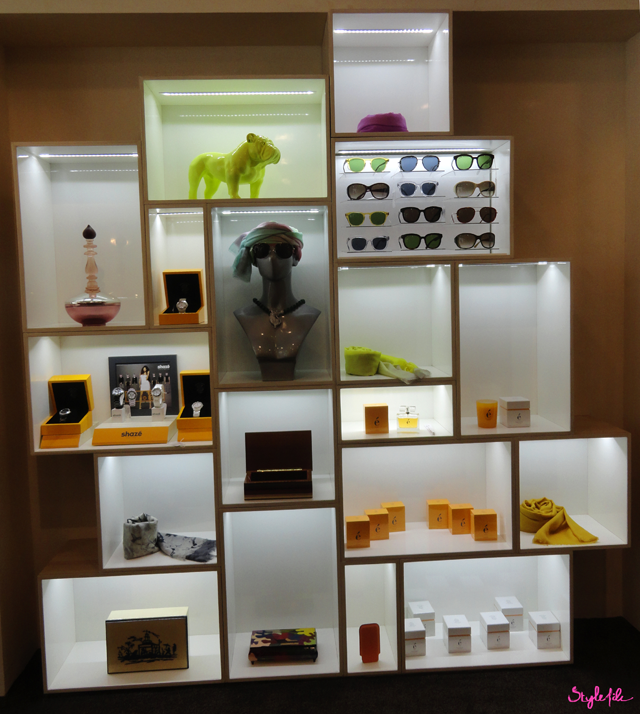 Their sunglasses and scarves are sight to behold so all your accessory needs are taken care of, under one roof. Next time you're dressing up, take a second and think about making every day an occasion worth dolling up for, and then slip on that pair of earrings. 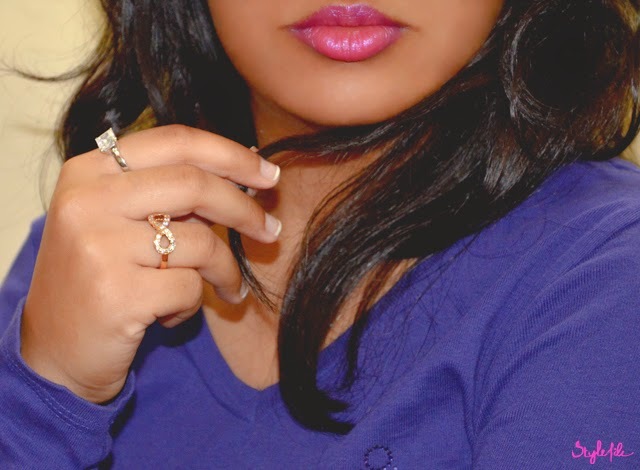 With a style as minimalist as mine, accessorizing has always been my Achilles heel. 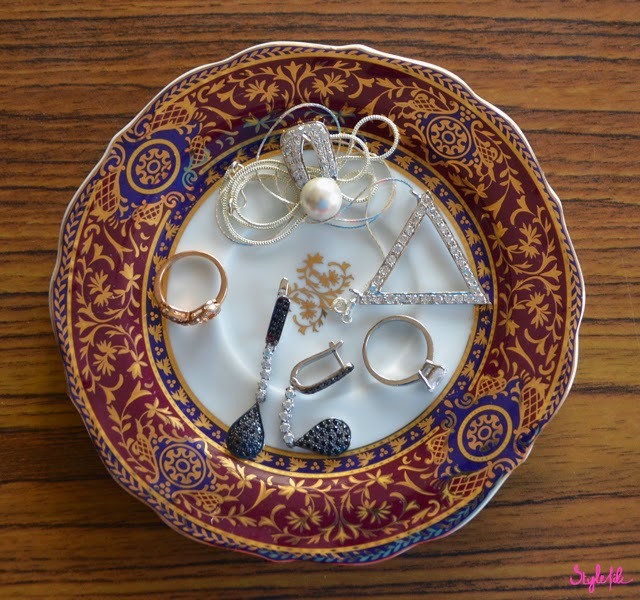 Up until a few years ago, my teenage jewellery sensibilities consisted solely of silver bracelets and oxidized chains. As the years have past, I've noticed a distinct sense of accessorizing and style that has set in for me. While still staying true to my love for all things minimal, I now take a shine to pieces that are petite, sparkly and effortlessly chic. And that's how I met Ziveg. 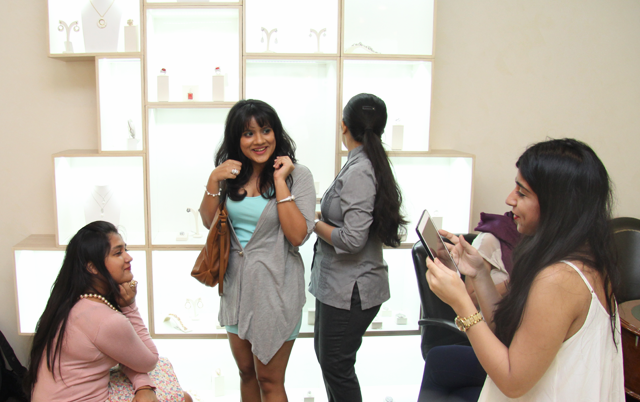 A new face in the online jewellery segement, Ziveg believes in celebrating the unforgettable moments in life. Who wouldn't want that special anniversary marked with a sparkler on your finger or a friendship for the ages celebrated with a marvellous pendant. 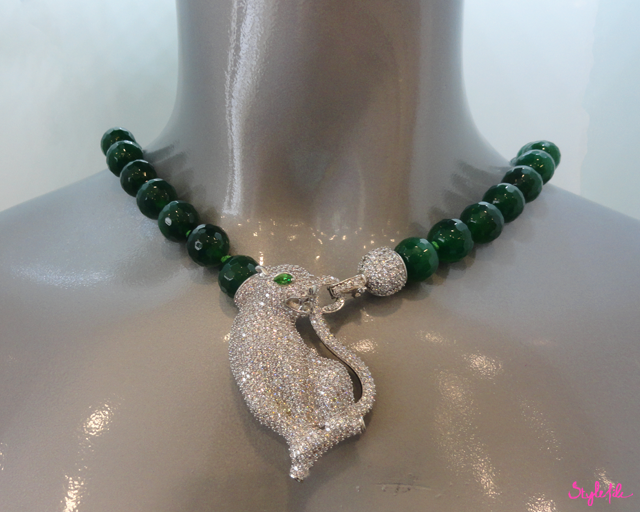 The Ziveg website interface is concise and showcases all their best sellers as well as jewellery crafted with precious stones in shades unimagined. 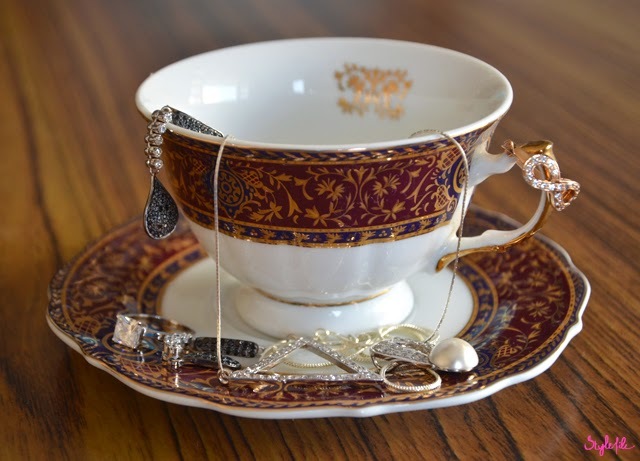 Fantastically enough, they release a new collection every month for your jewellery box to stay up to date and a 30 day free return as well as for you to purchase from Ziveg with utmost confidence. 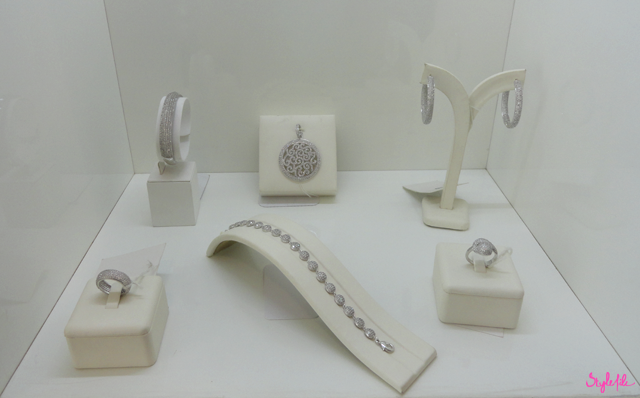 Their pieces have a distinct sense of elegence without even trying. For every occassion in your life, you can be sure they have a pattern. Solitaires are a personal favorite ever since I tried my mothers prized possession when I was a little girl while my rose gold infinity ring speaks of love being eternal without saying a word. One of Zivegs greatest highlights is its recently launched Black Collection which features a first-of-its-kind range of jewellery in fashions favorite shade. The dark hued precious stones are a statement in itself and when paired with sleek silver or ravishing rose gold; you can make sure all eyes are going to be on you. From rings in sophisticated cuts to edgy styles, this collection, in short, is a work of art for your body. Every jewellery box deserves to have contrasts; so classic solitaires and edgy black might be a favorite, but pearls always stand the test of time. 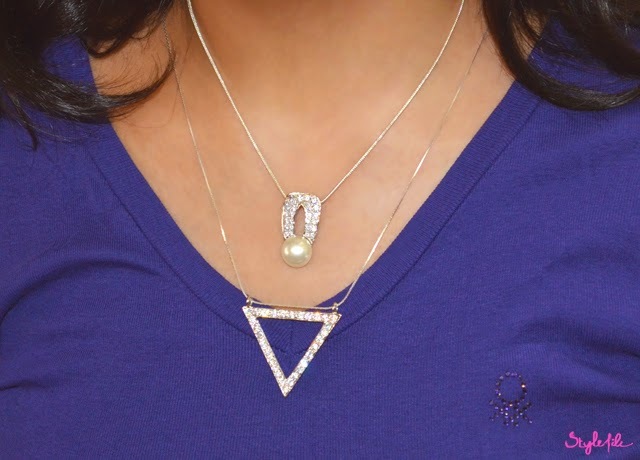 While layering necklaces is a trendy trick that this year saw, I decided to try it out by bringing together geometrical shapes and eternally-in-style, pearls. You know how I love me some sparkle, especially at this wonderful time of the year. So the ongoing Great Online Shopping Festival, is the perfect time to add to your jewellery box as it is a raining discounts on Ziveg upto 55% off! Make sure you head there and add some shine on! If there is one thing I know for certain, it is that a girl can never have enough clothes. Can I get an Amen? No matter how many shopping sprees you've been on or how many of those 'just one more' splurges you've treated yourself to, there will always be another coveted pair of shoes or blazer or dress that will warm the cockles of your heart enough to land up in your shopping bag. Let's face it, whether it is an exhausting job task or a bad hair day, a spot of retail therapy can fix all ills. I know the feeling of 'this lipstick will match my new shirt' all too well and truth be told, I love how it can lift my spirits in an instant. Something about this jolly December spirit and a trendy selection at FabAlley has inspired me to create my very own Fab Wishlist with a range of clothes, shoes and accessories all available at the FabAlley website. On most days, I'm all about comfortable fashion which still looks groomed. 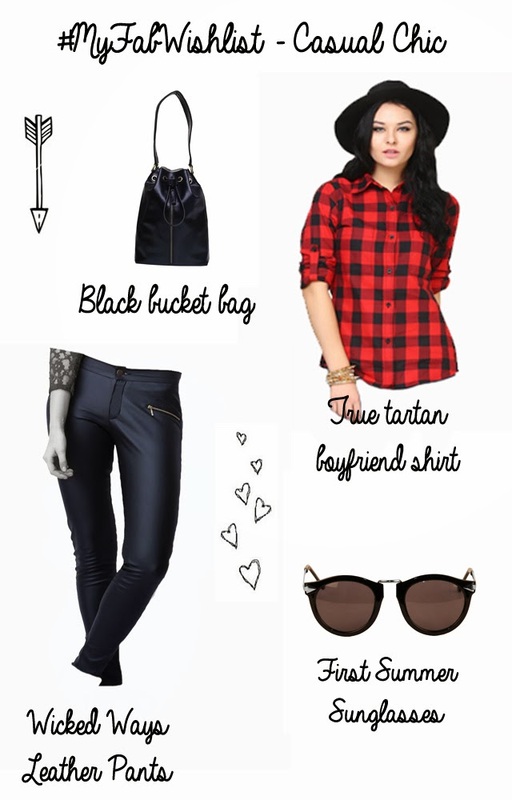 My current obsession of tartan reveals itself with the True Tartan Boyfriend Shirt combining with the Wicked Ways Leather Pants for an edge. Gotta protect those peepers with the First Summer Sunglasses and store my everyday essentials in the Black Bucket Bag. 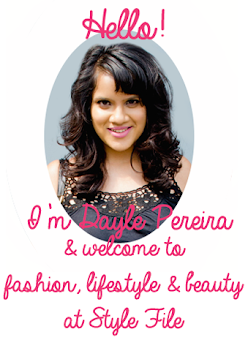 With all the parties to hit and places to be this season, getting glammed up is high on my agenda. My absolute favorite print of polka dots looks delightful in the Game of Dots Tshirt dress and to add pizzaz, nothing like the Sequin Power copper blazer. The Calvin Klein Black Wallet adds effortless sophistication while the Gloss Burgundy Pumps pull the whole glitzy ensemble together. This festive season around the corner, you won't need to wait for Santa to gift you your dream closet. I would love to see your very own Fab List from FabAlley so make sure you pick your favorites & share it with me! With the trendy pieces and closet essentials at FabAlley, this season you can be your own Santa! I'm a year round glitter lover so when the festive season rolls around, it makes for the perfect excuse to dial it up. My sequin wrist wrap is one way I sneak in a little more sparkle into my look and yet another never fail way is on your nails. 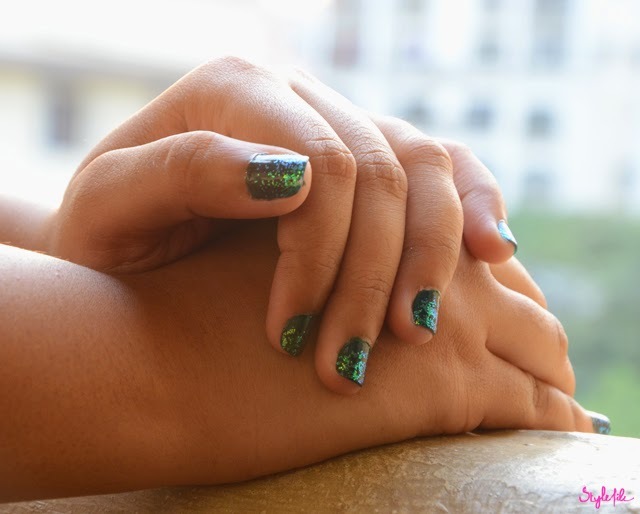 While glitter nail varnish is great and all, the glitter ombre nail shows more technique and will make you stand out in any crowd. I've used a paste glitter which makes it pliable. If you have only loose glitter at your disposal, mix it with a small quantity of water, just enough to make it damp. 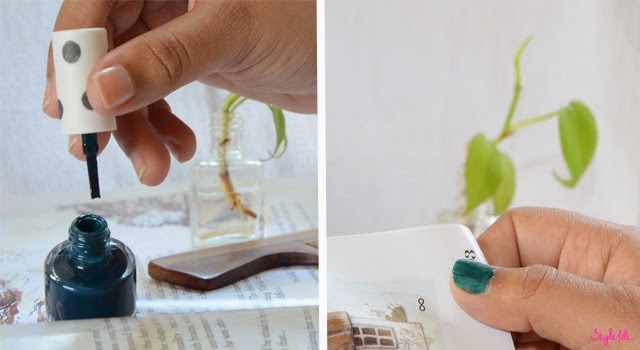 This technique is easiest on medium to long nails. A flat, solid shade of nail varnish works best so make sure you select a contrasting shade to your glitter for the best effect. A base coat is optional but one I always opt for so once you finish with that, get down painting your nails like its any other day. Paint one coat. Pause for it to dry. Then paint another coat. My nail varnish tends to appear streaky after just one coat so I'm going with two coats of nail varnish. Once my nails are painted with the solid shade, I want them to appear opaque for the glitter to appear most visible. 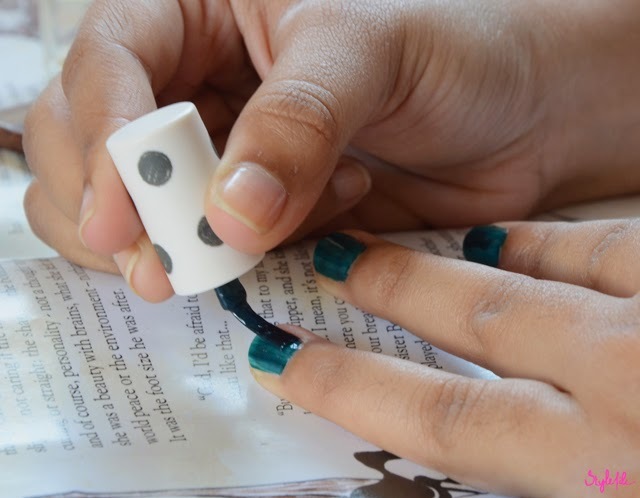 Don't wait for your last coat of nail varnish to dry completely. It needs to be slightly sticky to hold the glitter. Using the cotton bud, apply the a thick line of glitter on the tip of your nail. Then use the cotton bud to pull the line of glitter downwards, in the direction of your nail bed. Make sure to do this gently and swiftly. Bring the glitter to the mid centre of the nail so that the base of the nail is bare. 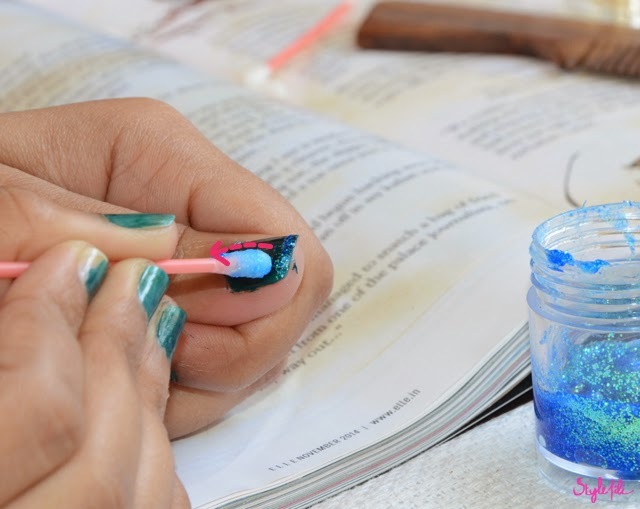 Go over the tip of the nail with more glitter to create the impression that the glitter is heaviest at this point. The technique can take some practice and a few smudges till you get it perfect. Make sure you do the same for your remaining 9 fingers. 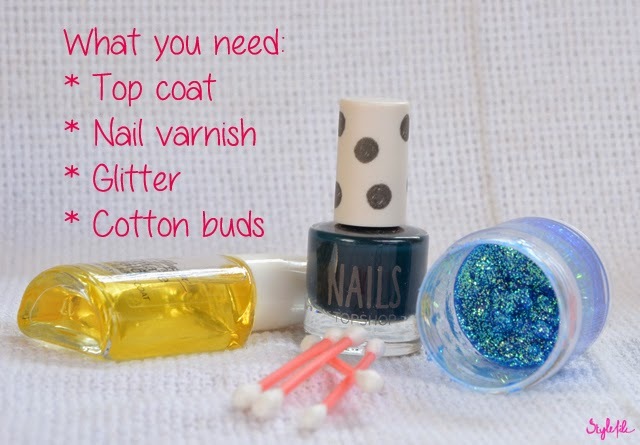 Once the glitter has dried out, cover it up with a transparent top coat. And there you have it - your digits are sparkly and party ready. I'd love to see you try this tutorial so let me know if you do!